Posted on August 17, 2011 by Greg C.
You have to hand it to the Miami Hurricanes and their football program. Â A constant source of controversy for 30 years, the most recent allegations are by far the most serious. Â Before we touch on the latest mess, lets review the past 3 plus decades of scandals at The U. 1978 – Miami players throw a man in a lake which results in the coach, Lou Saban, getting fired. Â The players threw the man into the lake because he was wearing a yarmulke. 1980s – Luther Campbell, a member of 2LiveCrew, had an alleged “pay-for-play” system that rewarded players for touchdowns and big plays. Â It was also in this period the team showed up to the National Championship game wearingÂ camouflage, adding to their ‘thug’ personality. 1995 – An athletic departmentÂ councilorÂ for the football team Â raided the Pell Grant program, which provides money for students who need it to attend college. Â The employee used the money to fund his cocaine habit. 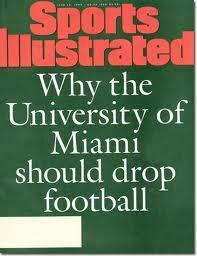 Â This latest scandal caused Sports Illustrated to write an open letter to Miami to shut down their football program. 2002-Present – A known criminal, Nevin Shapiro, used funds obtained in a Ponzi scheme to pay out over $2 Million in illegal benefits to players. Â The benefits ranged from “pay-to-play” to getting underage athletes into club and buying them prostitutes. Enough is enough. 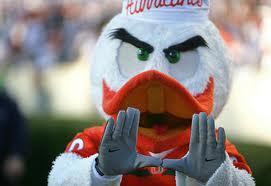 Â Writers, fans and others are now asking if University of Miami should get the death penalty. Â The NCAA handed one of these out before to SMU, and the football program has not been the same.